If you’re anything like me, you are still energized by the Democratic triumphs that took place last night. Voters in Bethel spoke loudly about the leadership they want for our town, and the people they trust to best represent their values. They rejected reckless rhetoric and misinformation, and reminded everyone of who we are as a community. Together, we supported and elected candidates that represent the best that Bethel has to offer. Congratulations to ALL of our candidates for running successful campaigns that engaged and energized the electorate. We re-elected Matt and Rich to their fifth terms, and they will continue to move Bethel forward. 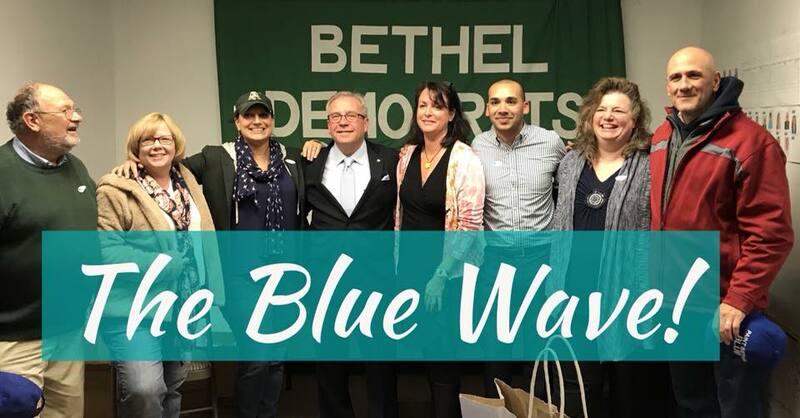 We also gained four Democratic seats on the Board of Finance, in addition to re-electing Bob Manfreda to the board, making five of the seven members Democrats. Wow! And there are numerous other accomplishments from the top of the ticket down. Our candidates, volunteers and supporters (many of whom were engaging in this process for the first time) did the work, made the calls, knocked on the doors and got the job done. The national events of November 2016 have certainly provided America with one notable positive outcome: the mobilization of a grassroots movement of doers who are willing to work as hard as possible to achieve their goals. Even with these successes, there is still so much work to do! 2018 will be a crucial election cycle. Let’s stay energized, motivated, and encouraged. But for today, take a moment to relax, regroup and reflect on the hard-fought victories from last night… We’ll need your hard work and commitment more than ever in the coming months. Thanks for everything you did to make last night possible.